Werner Herzog's Documentary Brings Oldest Cave Paintings To Life German filmmaker Werner Herzog was one of the few people permitted to enter a cave in France containing the oldest recorded cave paintings. What he saw — and what he imagined — is the subject of his documentary, The Cave of Forgotten Dreams. Herzog was only permitted to enter the caves for one week of filming. This interview was originally broadcast on April 20, 2011. The Cave of Forgotten Dreams is now available on DVD and Blu-ray. In 1994, three French cave explorers discovered hundreds of prehistoric paintings and engravings on the walls of the Chauvet Cave in southern France. Carbon dating has since shown that the depictions of rhinoceroses, lions, cave bears, horses, bison, mammoths and other animals are between 30,000 and 32,000 years old. That doesn't mean the ancient drawings are any less sophisticated than what artists create today, says filmmaker Werner Herzog. "Art ... as it bursts on the scene 32,000 years ago, is fully accomplished. It doesn't start with 'primitive scribblings' and first attempts like children would make drawings," Herzog says. "It's absolutely and fully accomplished." The acclaimed German director, who has produced, written and directed more than 40 films, gained exclusive access to the Chauvet caves. He tells their story and the story of the world's oldest cave paintings in The Cave of Forgotten Dreams, a 3-D documentary film. "Since early adolescence, I have been fascinated by cave paintings," Herzog tells Fresh Air's Terry Gross. "It actually was my personal intellectual awakening ... and shook me to the core — seeing an image of a horse [from the] prehistoric Stone Age. I couldn't believe it." Part of Herzog's interest in the paintings, he says, is the knowledge that tens of thousands of years ago, humans had the instinct to make art in order to represent the world around them. "It is strange and very significant that all of a sudden, we have the presence of what I would call 'the modern human soul,' " he says. "Neanderthal man actually did not have all of this, and other civilizations did not have it. And earlier human beings did not represent the world in figurative means — paintings and sculptures and so on." 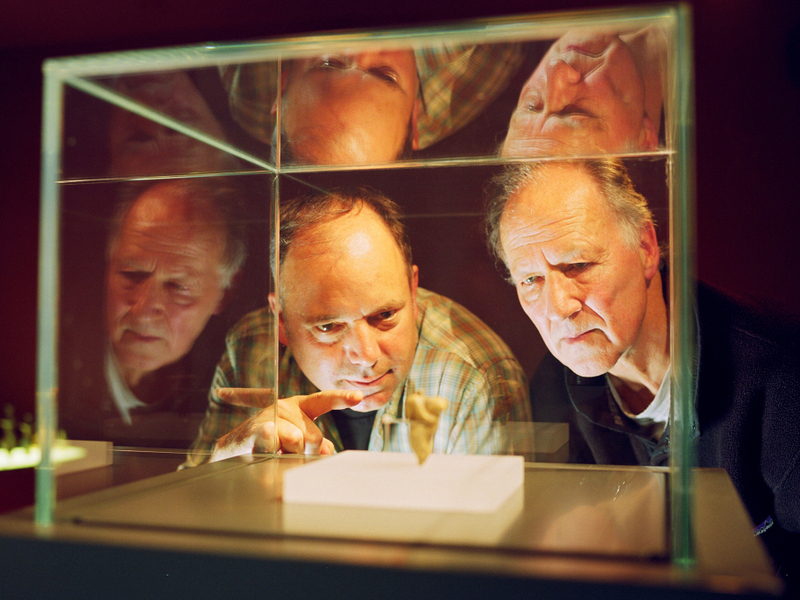 Anthropologist Nicholas Conard (left) and filmmaker Werner Herzog examine artifacts from the Chauvet caves in southern France. Making a documentary inside the Chauvet caves was a difficult endeavor — in part because the cave has so many restrictions. All visitors are required to obtain permission from the regional French government and wear protective body suits to prevent the spread of bacteria and biological growth within the cave. Herzog had to convince both government officials and scientists that he would film inside the cave for only one week. "I was only allowed [in the cave] for four hours a day," Herzog recalls. "I was only allowed three men with me. I was only allowed to carry along what we could in our hands. So we couldn't move heavy equipment in there. [I could only bring] lights that would emit light without any temperature. And, of course, you never step off the metal walkway." The men who accompanied Herzog into the cave are frequently seen in the film's final footage, mainly because they could never leave the metal walkway. But seeing the drawings inside the cave, Herzog says, made all of the restrictions worthwhile. "[The first time I saw the drawings], it was just a moment of complete awe," he says. "I was not prepared for the fact that the cave was so beautiful. It's like crystal cathedrals and stalactites and stalagmites and just like a fairy tale universe down there, and I was not prepared. ... Facing the paintings, it's just sheer awe how beautiful and how accomplished they are." "It's slightly humid. ... There is a plan to re-create the cave outside in some sort of what I called the Disneyland version. Since nobody's going to be allowed in the cave, they will replicate the entire cave. They'll replicate the paintings on the walls. And there was even a plan to re-create, in our imagination, the scent inside of the cave. Which means maybe some carrion of rotting cave bears, some fire, some ... resins. I've found a master perfumer who fantasize[s] wildly about how the odor may have been 32,000 years ago. However, when you are entering there, it is slightly humid. There's no significant traces of any smell of anything significant in there." "When I saw photos, it looked almost like flat walls — maybe slightly undulating or so. Thank God, I went in there without any camera a month before shooting. What you see in there is limestone, and you have these wildly undulating walls — you have bulges and niches and pendants of rock, and there's a real incredible drama of information. The artists utilized it for their paintings. ... So it was clear it was imperative to do this in 3-D, in particular, because we were the only ones ever allowed to film." "Arguably, or for me, the greatest single sequence in all of film history [is] Fred Astaire dancing with his own shadows, and all of a sudden he stops and the shadows become independent and dance without him and he has to catch up with them. It's so quintessential movie. It can't get more beautiful. It's actually from Swing Time . And when you look at the cave and certain panels, there's evidence of some fires on the ground. They're not for cooking. They were used for illumination. You have to step in front of these fires to look at the images, and when you move, you must see your own shadow. And immediately, Fred Astaire comes to mind — who did something 32,000 years later which is essentially what we can imagine for early Paleolithic people."